Big & bold Craftsman in the Kingman Place Historic District. 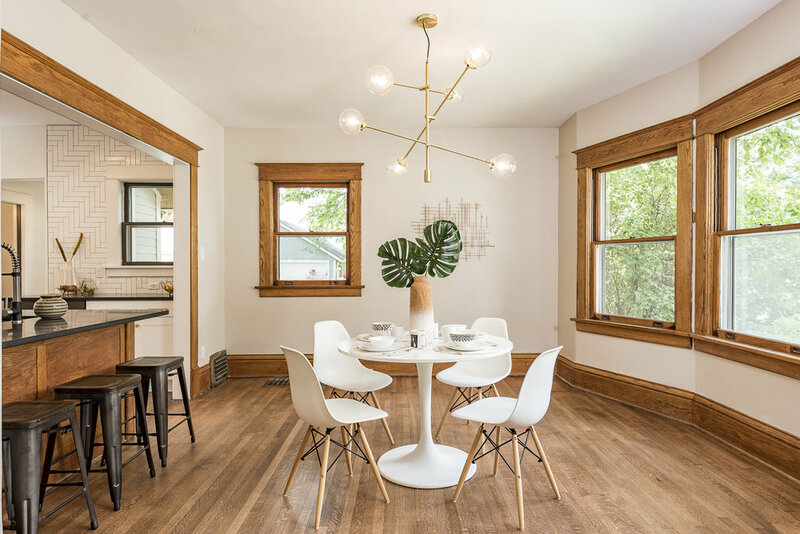 Located in the Kingman Place Historic District, this stunning 1912 Craftsman home is in the heart of the wonderful Drake Neighborhood. You''ll be just minutes from downtown & walking distance to local favorites like Mars Cafe. Large mature trees & stately homes surround this completely remodeled historic home with over 2000 sq ft of living space. Numerous permitted improvements include plumbing & electrical code updates, new roof, high efficiency AC, rebuilt front porch, exterior/interior paint, new driveway & insulation. Gorgeous designer kitchen with shaker style white cabinetry, black honed granite counters, herringbone backsplash, on-trend gold hardware & black stainless steel appliances. New powder room with black hex tile. Refinished original hardwoods flow throughout the entire main floor and 3 spacious bedrooms above w/ original built-in bench seating. The bathroom features a repurposed vintage vanity and tile shower. Finished 3rd story provides an additional bedroom & living space. 10 year tax abatement!